TGIF!! Since it’s Friday I thought I would share another ‘weekend wear’ look with you. This pinstripe shirt dress is a new staple in my dress collection. Pinstripe is huge for spring, and I love the tie waist detail of this particular dress – it adds a little something extra to the classic pinstripe shirt dress look. The best part about this dress though? The price tag! It is under $25. In fact, this whole outfit is affordable- nothing is over $75! While I think it is important to invest (if you can afford to) in classic wardrobe staples such as a black pencil skirt or black pumps; when it comes to fun trendy pieces, I look for items that are affordable knowing that I will only wear them for a season or two. A perfect example are these white floral ankle boots. I am obsessed with these for spring – they are the perfect trendy item – and they are affordable. They are now on sale for under $25! I am really impressed with these boots for the price (the store can be so hit and miss). The flowers are embroidered on and they look really well done. I will be wearing these boots a ton this spring both with dresses and with skinny jeans. They are just so freaking cute! Also, given the price, I was unsure how they would be comfort wise – but i actually have found them to be really comfortable. I wore them out one afternoon where I walked for probably 20 minutes to and then from a restaurant and my feet didn’t hurt at all! Alright, last but not least this rattan circle handbag! 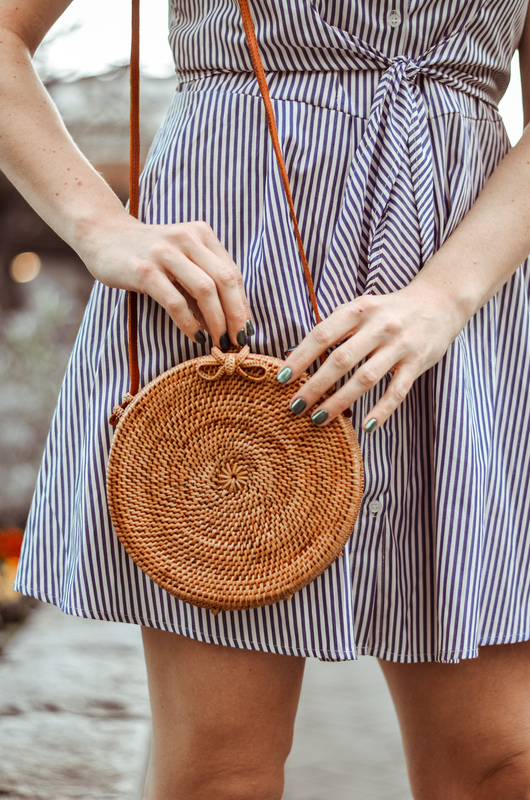 I styled my rattan bag with this midi skirt and crop top outfit earlier this month; but wanted to share it again on the blog as I really will be styling it with a ton of outfits this spring and summer. Between it and my favorite Cult Gaia Ark Bag Dupe, I am basically set for summer handbags! Currently Shopping & a GIVEAWAY! "Real Talk: Botox (FAQ’s & My Personal Experience)"
"The Best Highlighter & My Favorite Makeup Look for Spring"
A very nice outfit; perfect dress for spring and summer! Those booties are amazing, gorgeous! I love everything about this! Such a great dress, and those boots are show stoppers! Have an awesome weekend Lee! Aw thank you so much Elise, that’s so sweet! Hope you have a great weekend as well! These pictures are just adorable! I love the pinstripe dress and those boots are just fabulous! Aw thank you! So glad you like it! The boots are so fun eh!? They also come in a blush pink color which I really want as well!